Allan Massie first came to prominence in the 1980s, at the same time as other Scottish novelists such as James Kelman and Alasdair Gray. Yet in almost every way he was their opposite: politically (a Tory), geographically (rural) and artistically – a writer of traditionally-fashioned historical novels, focusing on ‘great men’. Having written four more or less contemporary novels (The Death of Men was based on recent events, the others were comedies of manners), Massie found his voice in a fictionalised autobiography of Augustus. This was followed by five further Roman novels, as well others focusing on such diverse figures as Sir Walter Scott and King David. Perhaps his greatest success, though, came with a loose trilogy which looked at issues of loyalty and betrayal, beginning with A Question of Loyalties in 1989. It is from this work, set partly in Vichy France, that Massie’s new novel seems to spring. 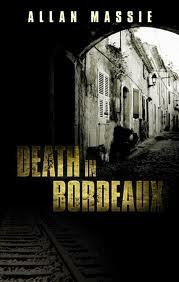 Death in Bordeaux is a departure for Massie, however, as it quite clearly intended to be shelved alongside other detective novels – including presumably those of Philip Kerr, creator of German wartime investigator Bernie Gunther. Massie has previously reviewed Kerr’s work unfavourably in the Scotsman, and it tempting to see this novel as a further riposte. (Kerr was supposed to have retaliated with an online savaging of one of Massie’s books). Massie’s great skill here is in portraying these political problems as personal ones. If Lannes is the detective as family man, then much of the evil in the novel radiates from a dysfunctional aristocratic family. The novel, as you would expect, opens with a particularly grisly murder, but Lannes’ acquaintance with the Comte de Grimaud comes at his own request, the result of a number of threatening letters he says he has received. His own unpleasantness is quickly apparent, but his family (most of whom he dislikes) are equally grotesque, excepting his young (third) wife and a grandson. Unsurprisingly, the two cases are linked, but to say much more would spoil the pleasure of discovery as the narrative unfolds. Much of this is political and Lannes struggles at times to keep the investigation open in the ever-changing situation: the novel begins before the Germans invade France, but ends after the occupation has begun. Massie leaves him with enough determination for the reader to admire, but without the unrealistic recklessness of pulp fiction – another advantage of being a family man. This is an excellent addition to Massie’s oeuvre and the rather over-populated detective genre. It is intended to be the first of a trilogy, which presumably will take us through the war. I suspect this is why Massie has taken such care to introduce a cast of characters that will allow him to explore the effects of that conflict on France in full. I, for one, am already looking forward to the next volume. You are currently browsing the archives for the Allan Massie category.